MYMUSAIC - Picture video maker for Instagram. Create slideshows with your pics & music. 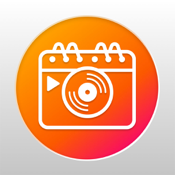 Simply sync your photos to the Music You Love! Let your photos keep living in fun photo video stories. Have friends who shared an experience? 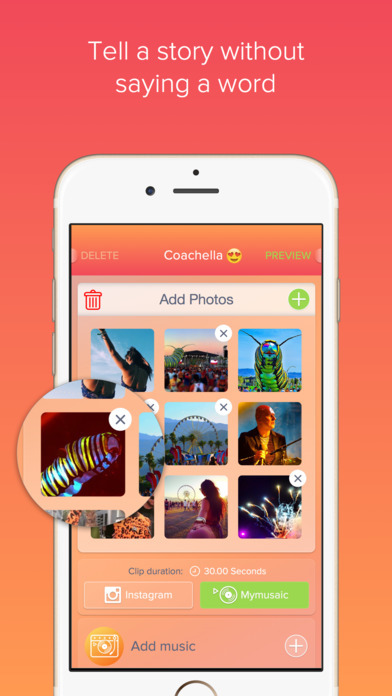 Collectively capture experiences with shared albums easily accessible through secret codes! Let others upload their pics and clips to your event and make powerful movies with the best content from others who were there. MYMUSAIC's magic sync helps find the right timing for each photo and match it to the rhythm of your music. No more out-of-sync photo and music slideshows! + Keep each video completely private and secure forever, share it with a limited group of friends, or post it publicly. You have the control. It's like having ole Marty Scorsese in your pocket, you know he made the music video for Michael Jackson's "Bad" right? With updates and new features coming soon, you are just in time to get creative with us. Perfect for anything you want to remember such as simple beautiful moment with someone you care for, a fun trip, sports event you attended, concert, or just having fun with friends, this app allows you to gather all the photos taken by people at the event, and turn it into a movie with music. It is a fantastic way to make your experiences truly memorable that you can relive anytime by watching the movie made by this app. Events cont'd, after any event get the best pics from people who shared the experience by creating an event and tagging them or sharing the secret code to let them add their pics to the event. The app will help you merge the pics from all your friends into movies that move to the beat of the music you love. You will have that experience preserved forever, stored free on your private account. - Make a movie with your own pics or get the best pics from friends by creating an event and sharing the secret code to invite contributors. - Create - Select the best pics and clips, pick a song, and let MYMUSAIC merge it with the beat of the music. - Share - #mymusaic on Instagram, Twitter, or Facebook . Or go private and share with directly with friends on MYMUSAIC or through text and email. GET FEATURED Use #mymusaic when posting to get featured on the official @MYMUSAIC official account! If you are traveling, attending a music or a sports event, or just hanging out with friends, delight your friends by taking all their photos, merging them together, and creating a music video of the event. Each event will be something you and your friends will share for years to come, and will always be able to look back at the photo collage videos created on this app, and relive some of the most exciting moments of your life. This app is great for event organizers too. It is an amazing way to create a photo and video timeline of your events, and to make your events more social. This will enhance the experience of your attendees, making your attendees more social, and getting them to share their memories of your event with their friends. And that extra social excitement will get your attendees to share your events with friends and spread the word about your events.